Gravyty is focused on making artificial intelligence the system of action that helps frontline fundraisers build more relationships at scale and inspire transformational gifts. In this Feature Friday, we’re proud to unveil new ways our AI-enabled tools drive fundraiser action. 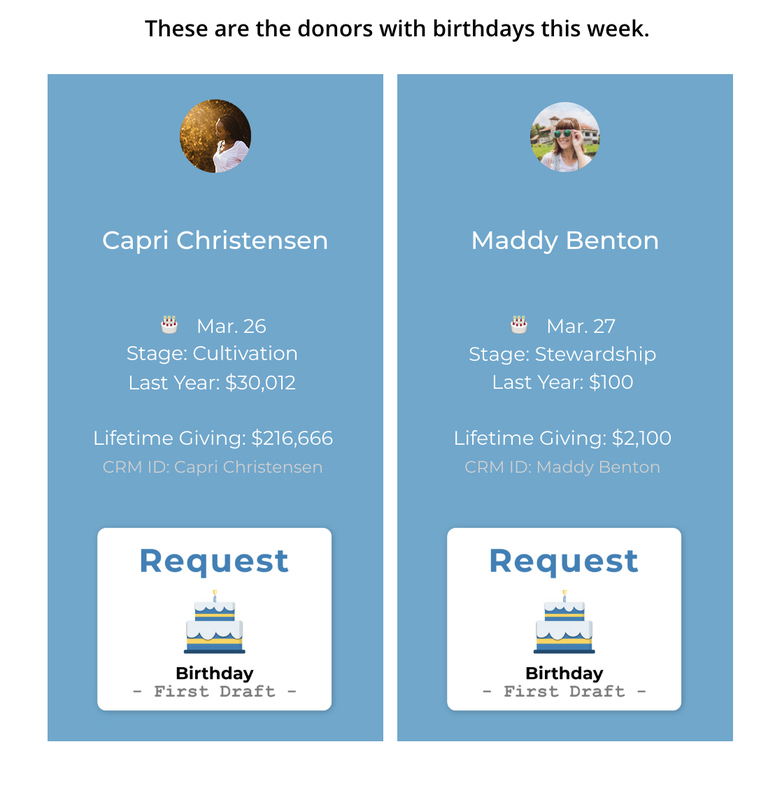 Today’s updates include our new donor birthday feature for Gravyty Guide, updates to last action and lead scoring, continuous performance improvements, and more. Making personal connections with potential donors is the key to developing, maintaining, and cultivating relationships. What’s a better reason to reach out to someone than to say “Happy birthday”? Now, inside the Gravyty Guide that you receive every Monday morning, Gravyty will identify which of your donors have upcoming birthdays. To reach out, simply click on the “Request Birthday First Draft” button and Gravyty will serve you a personalized First Draft birthday message, directly to your inbox. When Gravyty first launched First Draft and began expanding the fundraising workforce with AI, our customers were thrilled to finally have a way to reach rated but unassigned donors stuck in suspect or discovery pools. As our customers have qualified, engaged, and developed relationships with donors in these pools, we’ve learned a number of ways to optimize outreach. We recently released a feature allowing fundraisers to customize auxiliary portfolio outreach – giving them more control for how they fit it into their workflow. Customizations can include the number of times a fundraiser wants to reach out to prospects over the course of a year, how to consider giving history in lead scoring, and more. Fundraisers use First Draft as the one place they need to look before reaching out to a potential donor. To ensure that fundraisers have precisely what they need to make that outreach most effective, First Drafts now can include an organization’s last action in the lead scoring section of the email. Now, fundraisers can always have the most recent history of interaction right in their inbox.